A simple black façade with the Virginia Woolf quote, ‘A woman must have money and a room of her own’ embossed in white brings me to an abrupt halt on Rathbone Place, a lane tucked behind the hubbub of Oxford Street. This bold sign on an otherwise unassuming building front is the only indication that I have found what I am looking for: The Allbright – the first women-only members’ club in London. It’s within The Allbright that I am due to meet Emma Rayner, one half of the young, female duo who has set up the luxury design studio, No12. The interior architecture and design practice may only be a few years old, but they already boast a colourful portfolio – including The Allbright’s interiors. 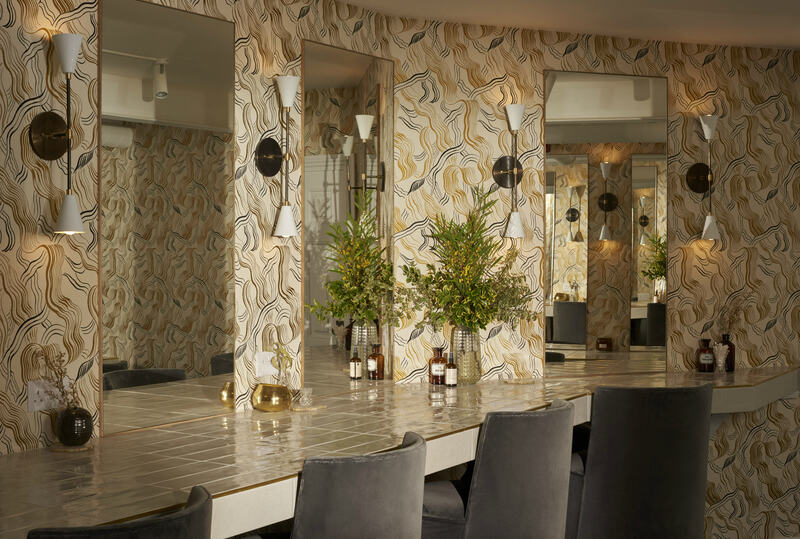 Stepping into the members club, it’s easy to see why No12 were the perfect choice; stripped wooden floors compliment the bright, stylish marble coffee bar. The muted colour scheme is balanced by vibrant splashes of red and blue in the paintings – by female artists – that dot the walls. A business woman sits at a large round table, clearly feeling at home with her work spread out across the polished wood in front of her. I’m ushered into the conservatory-turned-café space to meet Emma; under a skylight-ceiling, smatters of gold and green colour the space, from hanging baskets of ferns to the sophisticated velvet chairs. Somehow, even in this small room, there are three different kinds of seating. Luckily, my seat is chosen for me; at a small, round table, Emma smiles and motions for me to sit down in a plush armchair opposite her. After meeting and working together at 1508, Katie and Emma set up No12 when they saw a gap in the market; “I think we’re quite different to what is out there,” Emma remarks. Some of No12’s earliest projects were luxury residencies, but the duo hasn’t been afraid of branching out. As well as creating The Allbright’s interiors, No12 has recently finished working with WilkinsonEyre and Jonathan Tuckey on the Gasholders London, where they been responsible for the project’s common areas and two show apartments. So what sets No12 apart from other London design practices? Emma explains that it’s the design studio’s style. “We’re inherently masculine in our style,” she says with a laugh. “I like that you can’t tell [we’re women]; I think it’s nice not knowing and not initially going ‘this is a really feminine space, it must be a female designer’ – there are no stereotypes of what women like. We like to be super flexible; it’s nice to have that point of difference”. “Everything that has been in the interior design world – in London especially – hasn’t changed very much recently,” continues Emma. “There’s so much of the old way of designing from the powerhouses - which are amazing, and they do great things - but it’s details, on top of trims, on top of shiny piping… We respect that because we’ve done it – it’s beautiful – but we very much value pieces for what they are. When you adorn something so much, you lose the beautiful detail; it’s hidden behind the trims of the 20 other cushions on the sofa”. Instead, Emma tells me that for No12, every piece of furniture needs to define itself within the space. “We always interrogate a design as much as possible and ask why we have used those pieces, why they’ve been chosen, to give [the plan] a bit more integrity. We don’t over decorate, and that’s why each piece is so strongly questioned. It has to be beautiful on its own. It’s brave and bold, but it works and we like it. It’s slightly more of an architectural mindset; we’re letting the materials sing on their own”. No12 were brought in from the very beginning of the design process for The Allbright; Debbie Wosskow OBE and Anna Jones, the women behind private members' club, had only just found the Grade II listed 5-storey Georgian townhouse. “[The founders’] ambition for the member’s club is amazing, but it involves so many different things, so the space has to do a lot,” Emma reveals. “There was a lot of strategy at the beginning [of the design process], in terms of space planning and making sure we could tick every box”. What boxes might those be? Set over all 5 storeys of the building, The Allbright offers members and guests a plethora of different spaces to enjoy; the lower-ground floor alone features a gym and vanity space. The first floor is a café-turned-dining space, and ascending the stairs to each of the upper floors, members will find two floors of flexible seating and workspace, two meeting rooms, a prosecco bar turned presentation space, and another rooftop bar. Not only were No12 challenged by all the different ways the spaces needed to work, but there was also no specific brief to follow. “It was very much about how the space [would] work,” explains Emma, as we make our way slowly through the different areas within The Allbright. “We asked ourselves: what do modern, working, London women want from a member’s club? We definitely knew it wasn’t going to be millennial pink”. “It needed to be sophisticated, and quite luxurious. Everyone nowadays works 24/7 - it’s so flexible now - so it needed to feel like a café if you wanted it to be; or [be as] if you’re at home on your sofa; which was really interesting,” she continues. 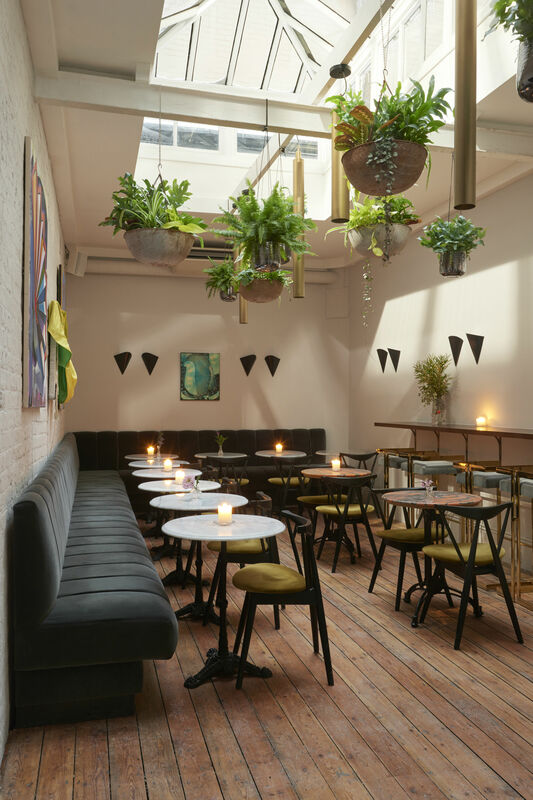 “[We needed to] make it a space that feels like you could come and relax here, sit and have a drink, or it’s a really easy space to sit, hide away and work, which lends itself to all the different types of seating”. It’s easy to see what Emma means about these different types of seating; all of the spaces within The Allbright have an eclectic feel, with each area featuring an abundance of different styles of furniture. Mentioning this to Emma, she nods. “[It’s] what our studio is all about, really – curating furniture. We always go to Spitalfields Market on a Thursday; I love a bargain, or an antique find. [I love] vintage pieces that we can reupholster in a different way”. 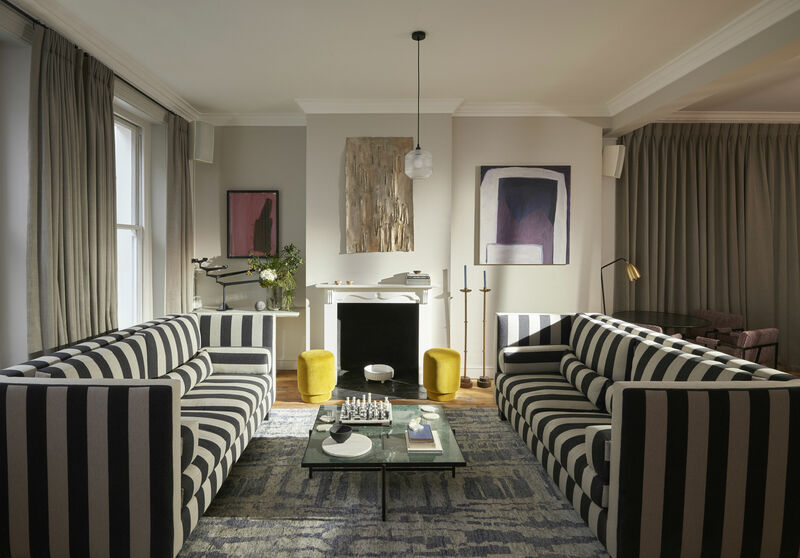 On the first floor of The Allbright, my eye is immediately drawn to two large black-and-white striped sofas that dominate the main room. A bespoke set created for members' club, they have been christened the ‘Beetlejuice’ sofas – and it’s no surprise why. They are a brave choice for such a unique space, but Emma thinks nothing of it. “This space is not about being held back. It needs to be so many different things”. “It’s so different from designing a home,” Emma continues, “because it’s more temporary. You can be braver and bolder with the colours and patterns - but if you move all the pieces around they still work together, which is happening”. One of the reasons why The Allbright’s furniture is moved around is for the presentations and talks that take place on the building’s second floor. Featuring a large projector screen that falls down in front of the windows when needed, the floor is also home to a very special prosecco bar. What inspired this idea? Emma tells me it was partly due to this space hosting most presentations. But she also shrugs, revealing, “There’s no running water on this floor, so we put in a prosecco bar instead”. It’s an easy fix, and certainly shows how No12 thinks outside the box. As we head further up the Georgian townhouse, two things become apparent; the first is that The Allbright’s colour scheme seems to be changing as we ascend the stairs. The second is that each storey has been given a name - from the lower-ground floor up: Lopokova, Morrell, Bell, Woolf and West. One of The Allbright’s meeting rooms is also called ‘The Lighthouse’, which gives me an inkling of the theme behind the names. In answer to the changing colour scheme, Emma smiles. “Because the lower ground has no windows, it needed to be very fresh and light,” she explains. “As you work your way up through the building, because of the way that the rooms change – on the top floor you’ve got the bar – the architectural finishes get darker. The top floor is beautiful; inky blue and very moody. Further down [the building] it’s very light and fresh, and quite calm”. As for naming the floors? “We pulled [our inspiration] from the women of Bloomsbury Set,” says Emma proudly. “We named all the floors - which were inspired by women who were part of the Bloomsbury Set or affiliated with the Bloomsbury Set – in reference to what was happening on each floor. The Bloomsbury Set were such amazing, forward thinking women, so it was a really great theme to be able to pull into the building. It gives the place a soul”. The gym and wellness area on the lower-ground floor, for example, was named after Lydia Lopokova, a Russian ballerina who was associated with the Bloomsbury Group. Meanwhile, the first floor has been inspired by Vanessa Bell, a core member of the Bloomsbury Set who as a painter and interior designer. “We’ve referenced her colour palette, [and the first floor is] very much about artwork. It was all curated by a lady called Beth, and it’s all by female artists - so it’s going to evolve as a gallery space representing these women which is brilliant”. 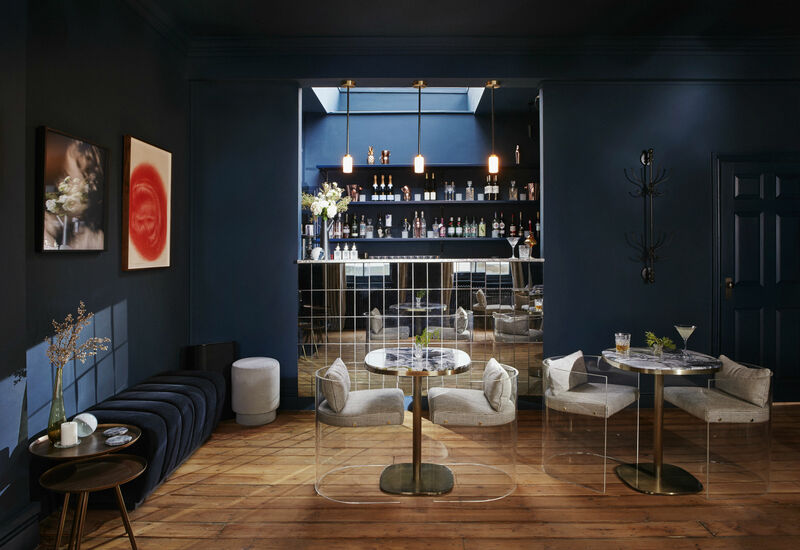 We finally arrive at ‘West’, The Allbright’s top floor cocktail bar inspired by Vita Sackville-West. The snug room features midnight blue walls and gold finishes; the high ceilings and brass lighting make for a sophisticated finish, and I am fascinated by the see-through chairs. Emma mentions they were reupholstered, and though “there is a lot of furniture in here, [the chairs] tuck right in around the base of the table so [the room] opens up for more people”. It’s another example of No12’s extraordinary attention to detail. As we amble back down The Allbright’s wooden stairs, I wonder: now that the private members' club is open, what does Emma think about coming back to the space she helped create? “I love going back to a project and seeing people use the space,” she says. “Working in residential, you don’t see people using the space or appreciating the space, so seeing people using it is so rewarding”. With 400 founding members already signed up, The Allbright has definitely hit the ground running. I mention that it must have been very exciting for No12 to be part of such a process; “what’s really nice is that there are lots of different types of women [coming to the club],” says Emma. 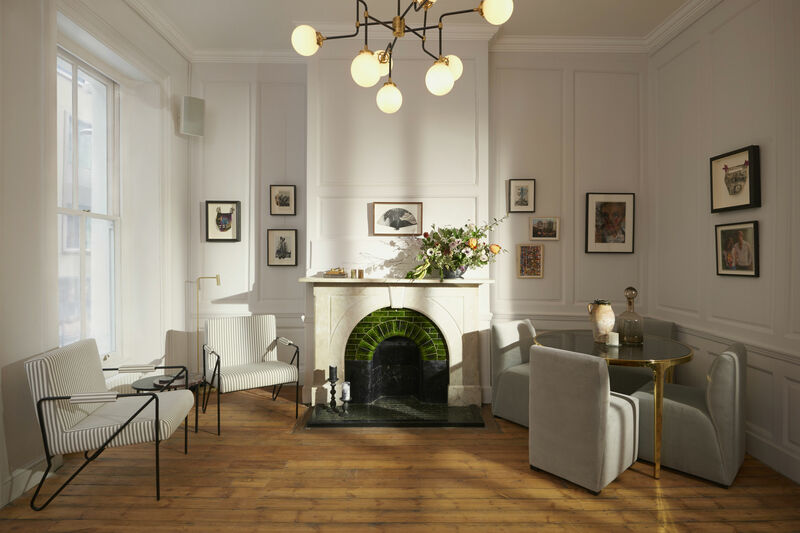 “[The design] really was [about] ‘what do professional modern women want?’” Considering how much the woman lounging throughout The Allbright seem to be enjoying the eclectic, vibrant space, it’s safe to say No12 have certainly answered that question.